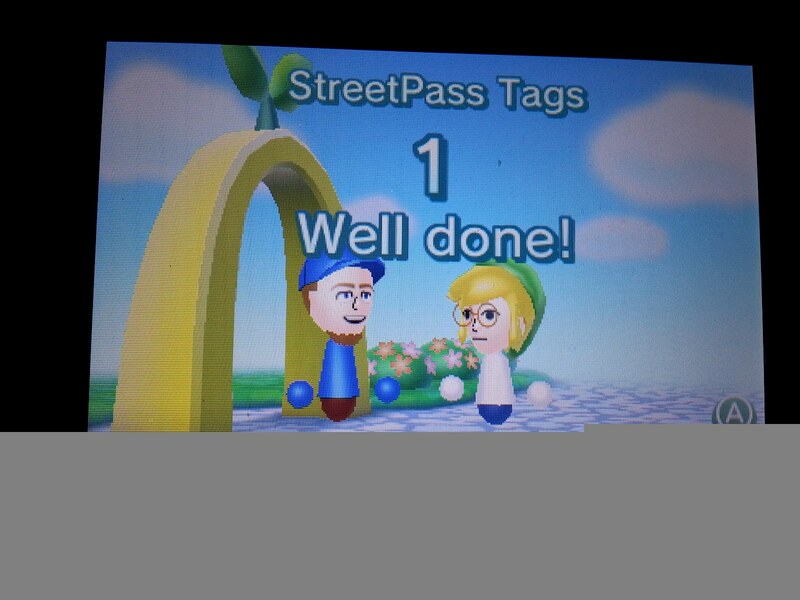 Those of you that follow the blog, especially the "Weekly Updates" likely note that I begin most installments with the same ol' gripe about not getting street pass tags...ever. Well, last week I nailed this beauty! Mind you, this was far from home on yet another road trip, but I certainly didn't expect it. 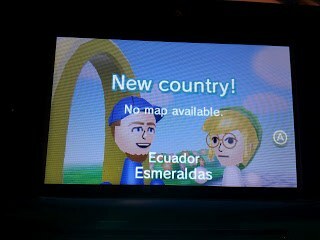 I was fortunate enough to be able to get a tag with someone from Ecuador! 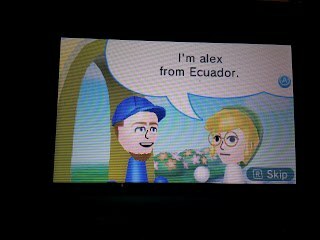 So many thanks to Alex for being in the same region that I was at the time! This might even be one that some of you in more "populated areas" that don't necessarily get a lot of foreigners like say a NYC or LA would get might have yet to receive! That said, I still look at some of the "accomplishments" and wonder how I'll ever pull them off short of going to Tokyo or something. I mean, "100" in one day? I think I've barely clipped 100 as is. Nonetheless, this was a very nice surprise and I can't complain about that. 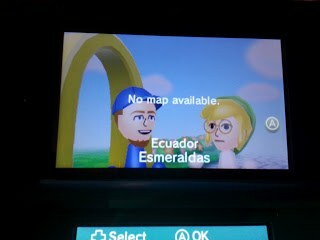 Here is in all the glory that is a Street Pass Tag from someone from a foreign country! 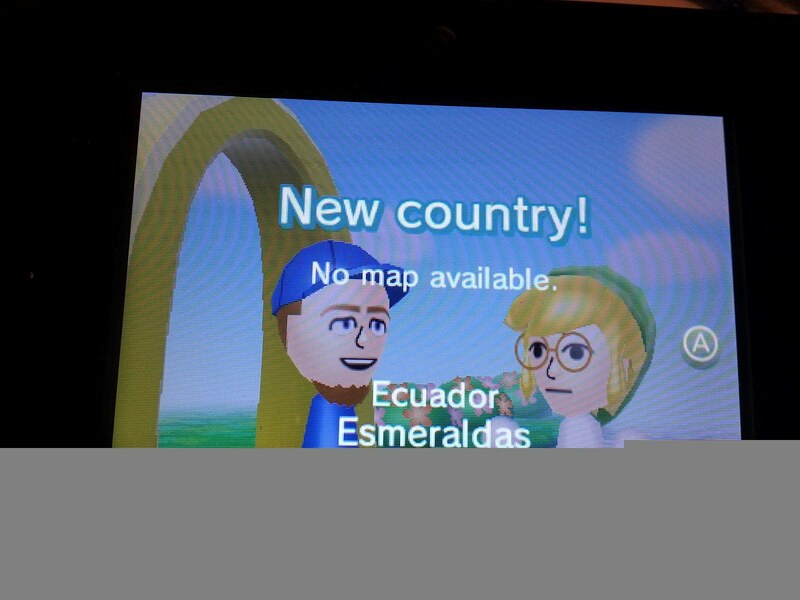 And just fyi, I have no clue why there isn't map data for it?! 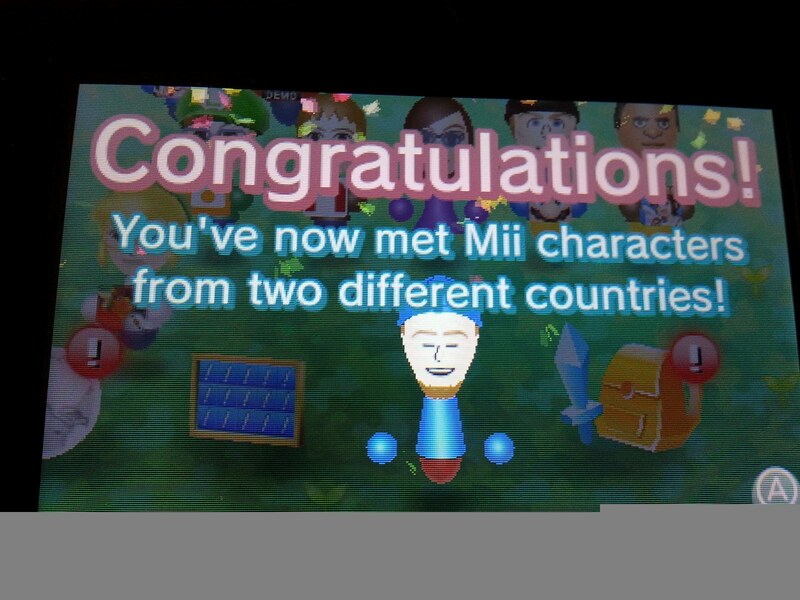 So yeah, check me out...I have Mii characters from 3 Regions and 2 Countries (meaning Ecuador counts for 1 of the 2 Regions)...How lopsided is that? 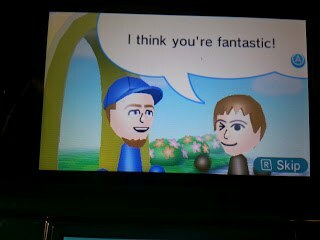 Nonetheless, it is what it is and that was a very pleasant and unexpected surprise. 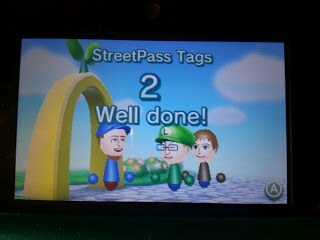 Just for the record that is also the only Street Pass Tag I picked up on that quick trip. And yes, I totally think it justifies having its own post, lol. 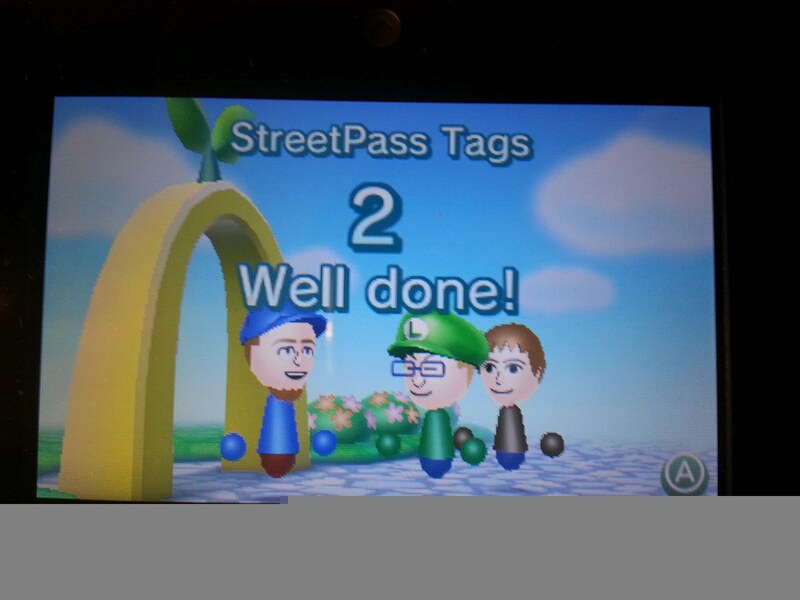 What are your Street Pass Tag bragging rights? Anyone gotten the 100 in a day? What about overall? How many regions have you gotten tagged? Well, Sunday, August 19th, 2012...that can only mean one thing for die hard Mario fans here in the US...you're playing New Super Mario Bros. 2! Any Special Deals? : Yes. 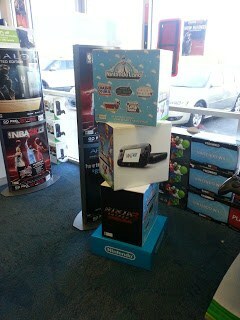 Buy the game at TRU this week and get 70% off any $19.99 or under Wii, 3DS, or DS Game! That is a sweet deal and netted me The Legend of Zelda Spirit Tracks for $5.99...you can not go wrong with that! What Are Your First Impressions? 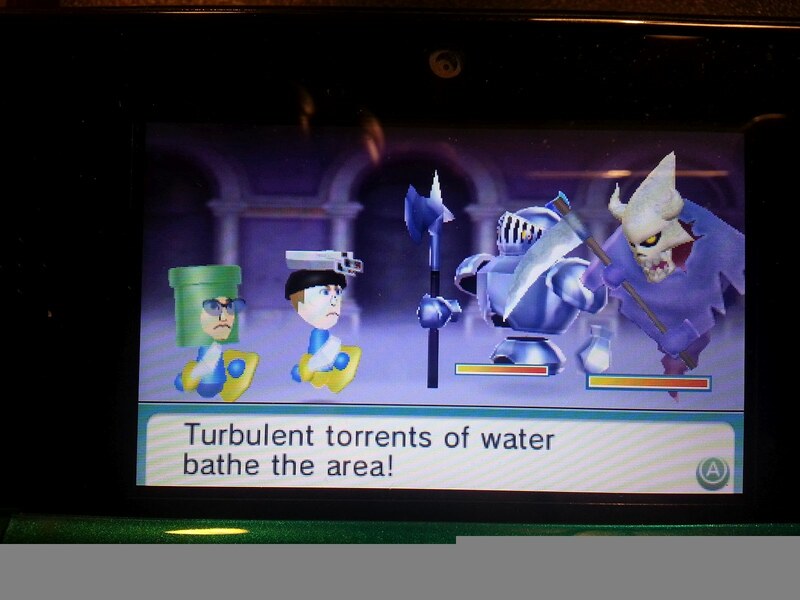 : This game plays a lot like you would expect. The graphics are better than NSMB (DS) and you can see the same graduated improvements we experiences in New Super Mario Bros. Wii. 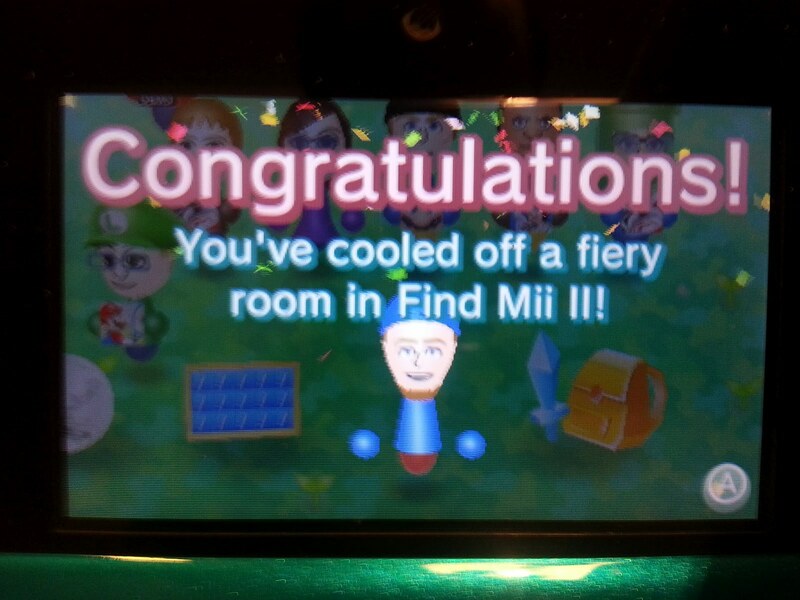 I have currently just played through World 1 with my Nephew in Coop Mode. 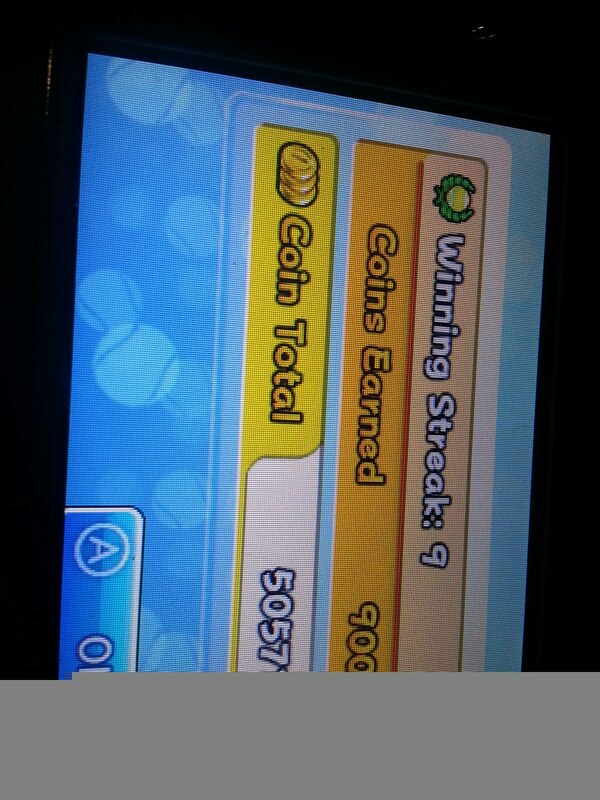 It was pretty much a cake walk, but it does look like some of the Star Coins might be challenging. While the unboxing edited/uploaded I went ahead and started a Single Player Save File...Plays just the same and is very enjoyable. If you are a big Nintendo or Mario fan this one is a no-brainer. 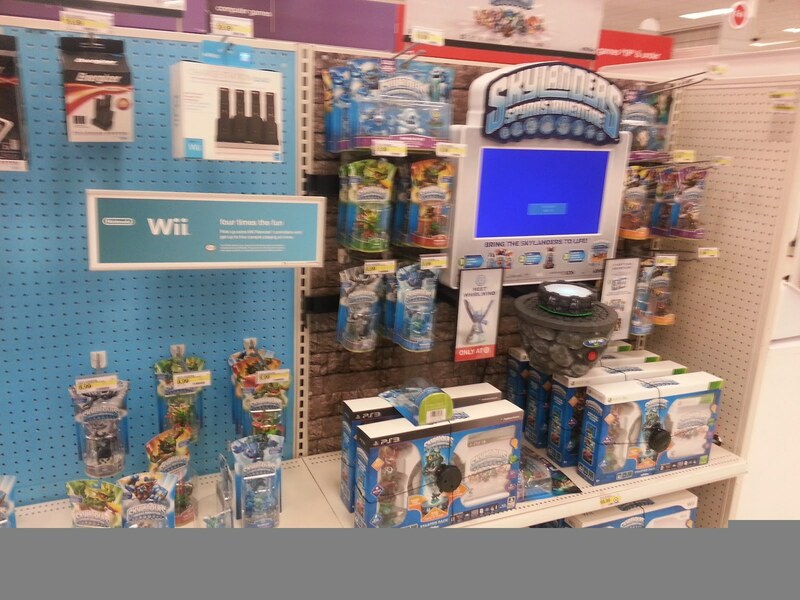 For casual gamers I think it is a can't miss. The game is very accessible and has that same "pick-up and play" that made NSMB such a hit for the DS and Wii. In fact, the game is so good, I am going to publish this blog post so I can get back to playing! I will update with further thoughts on the game etc. 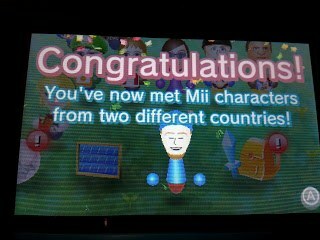 8/19/12: Purchased the game. Played Coop thru World 1. Started a Single Player File. 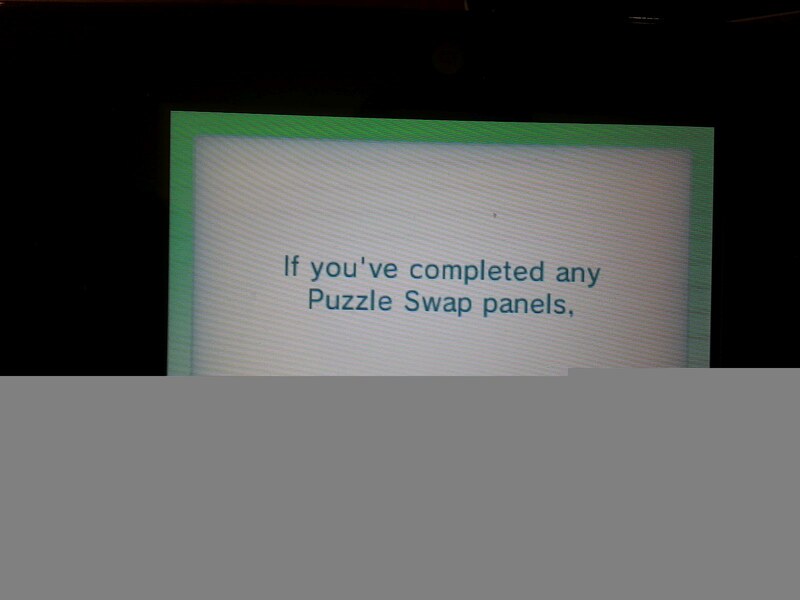 Completed W1. 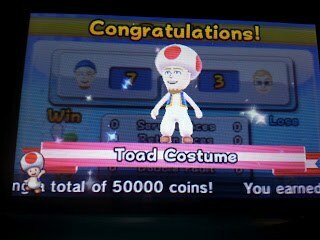 Clipped 4,000 coins on the day...Got notice of collecting 3,000 Coins. Went back into the World 1 Tower in search of the 2nd Star Coin...Found it, but before that happened I found the alternate exit that opened up the W1 Cannon and the path (new feature) to the Mushroom World. 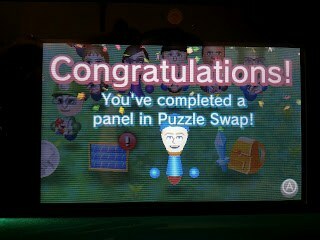 8/20-8/22/12: Got to continue the Coop File into World 2 and took out the tower. Single Player mode is getting pretty interesting. 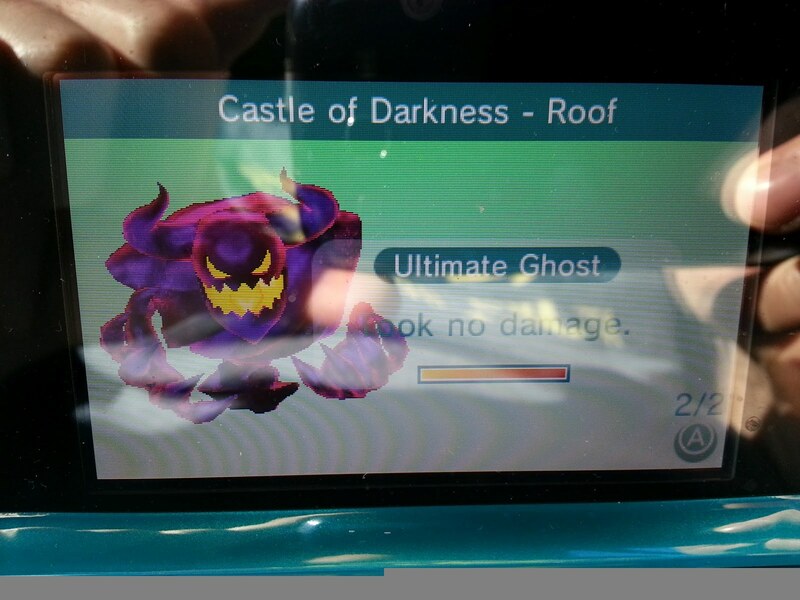 I am currently in World 4 and just completed the Ghost House about 8 times to finally get the alternate exit and all 3 Star Coins. 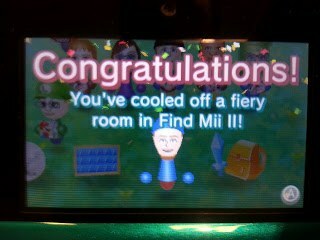 I would be much farther along, but I have made it a point to collect all 3 Star Coins from each level I have completed. So far I am only missing 1 or 2....and 1 of them is quite the problem at this point. That said, I did somehow replay 4-1 and did something to where the flag scene at the end sounded off in the old school SMB music and shot fireworks...next thing I know a rainbow appeared and I was in a Special Level. 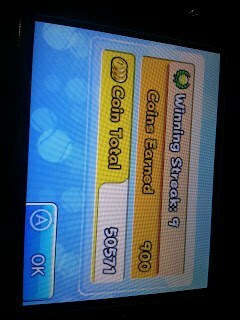 I've also clipped 20,000 Coins. 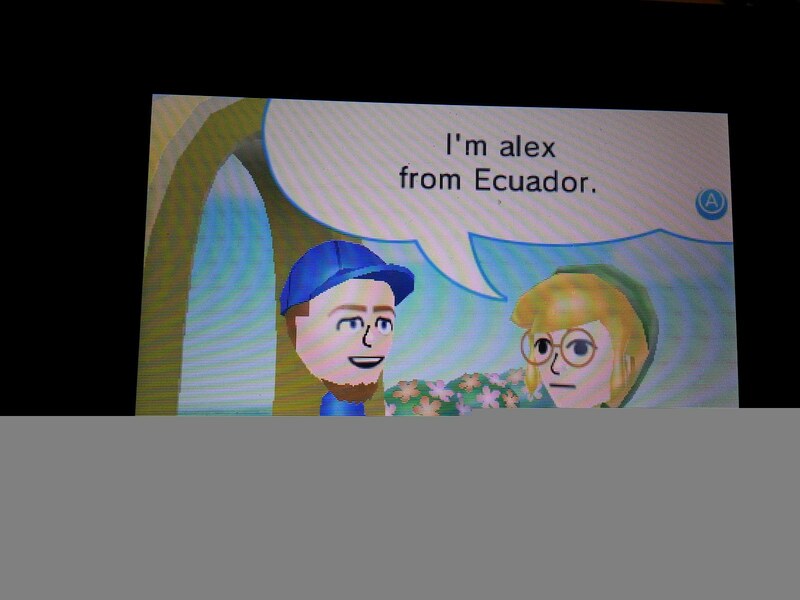 Hey...so this is kind of strange. I mean, don't get me wrong...it is well after midnight (3:59 AM to be exact) and here I am posting the (well part of what will be) the weekly update EARLY. I say that because technically it is Wednesday night to me, ie the sun hasn't come up on Thursday and I usually post this Thursday night when the sun hasn't come up on Friday. I'll go into that logic more later on...like this time tomorrow. I'm planning to upload 4 videos tomorrow...Shocked? There has just been a lot going on here lately and I didn't have any of the recorded stuff edited and ready for upload...That has changed as I am now 100% caught up on the edited recordings. That is to say...everything I currently have recorded, is edited! (Well, with the exception of PT#3...which is the long rumored, tragic playthrough that I'll detail in one of the upcoming vids). -General Update Video with details on Vids 3 and 4 and, perhaps more importantly, info on what I was recording that got majorly messed up. -Video 4...Kind of goes with Video 3, but you'll have to wait for it. Yeah, so does that mean anything to you? Probably not, but the good news is I feel like one of the giant boulders on my shoulders has been lifted. I will use your feedback on the "update video" to decide what to do about the "tragic playthrough." I think it'll all make sense once you see the video. 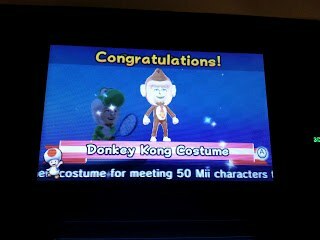 After that, I can resume uploading and simultaneously record the rest of Mario Kart Wii and whatever turns out to be Video 3 and Video 4. So there you have it...an early update at 4:05 AM that just might make sense to some of you who are tired enough to actually be on the same brain wave as me at this point. Well, this is the FIRST announcement of the newest developments and something I've worked on the last few nights. I am now on Google +. I know a lot of people signed up and left, or simply haven't taken the time to explore it. So far I am really liking it...It offers a lot of possibility to connect better and in my opinion is way more user friendly than those other "social networking sites." You are welcome to add me to your Circles...I'll likely place it below the blog and Twitter, but above Facebook. My favorite, and preferred medium of communication, is of course here on the blog. I do enjoy YouTube, but it has just become way too daunting to try and keep up with all the comments...It is especially hard to go thru and look for the "important" ones over some that are just totally random and pointless "ie I heart Justin" etc. I have had in the video descriptions and even mention it at the end of videos for quite some time that the blog is THE BEST PLACE to get a quick reply. I'm not sure many people listen to that, but oh well. I know those of you reading this are aware and hopefully realize I respond to blog comments pretty much every night (barring something crazy). Twitter can't be beat for really quick udpates...and since I can have it display on the blog, it makes perfect sense as a compliment to the in depth posts. I think Google + will function like Facebook does right now for me, but I'll probably provide more details there. 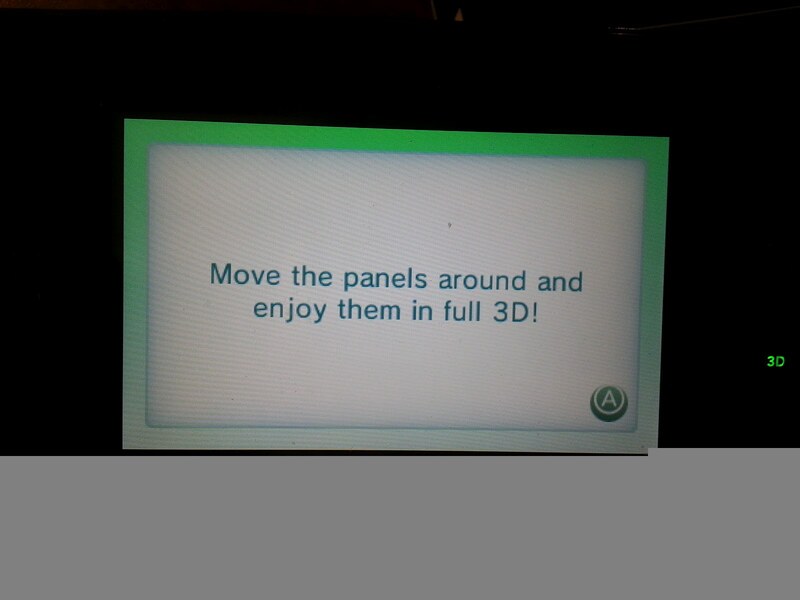 Nonetheless, I'm excited to see how it goes and if anyone else is on and how they like the new interaction abilities. So there you go...All 4 Videos just as promised! All 4 of our Round 3 Matchups have over 200 Votes! The margins aren't as close as the previous rounds, but we saw several late runs in Round 1 and Round 2...that could certainly happen here. I should be able to get the Round 4 Polls up...Check here on the blog or Twitter to keep up to date there. A big thanks to everyone who has voted..we are getting close to the Championship Showdown! I have up thru Part 16 edited and ready to upload. I hope to take on 150cc and record it while uploading the current stockpile of videos. This is just going to be a quick and casual playthrough of a game I feel doesn't get much love. I mainly just want to show the boards and of course highlight the bosses and minigames we encounter along the way. I really wanted to record this one. A lot of you really wanted me to record this one. I started recording this one and everything went wrong. A 17 minute video track and a 25 minute commentary track will never sync and there is no editing trick in the world to really make this even remotely close. That is extremely unfortunate as I think it would have been very cool. The main reason for this update video, aside from the Skylanders Battle Tournament info, is to get your feedback on Skyward Sword. I can upload things sync'd as best I can...without commentary...edited to my best ability etc and just hope for the best, I can attempt to start from scratch, or I can just can it all together. This is a great game and I feel bad not being able to offer a quality video for all parts...I have recorded 7 installments now and none of them are really going to be great...some are downright horrible in terms of how they sync up. With the game being requested by so many, I wanted to get your feedback. As you know, I can't just go in and replay certain scenes, so it would require a new save file...And that of course, might just result in the same issues. Well, it is really late and I need to try and get some sleep. Keep the votes coming in the Battle Tournament...I'll do my best to have the new polls live when they should be...result and matchup vids will come as soon as I'm back. 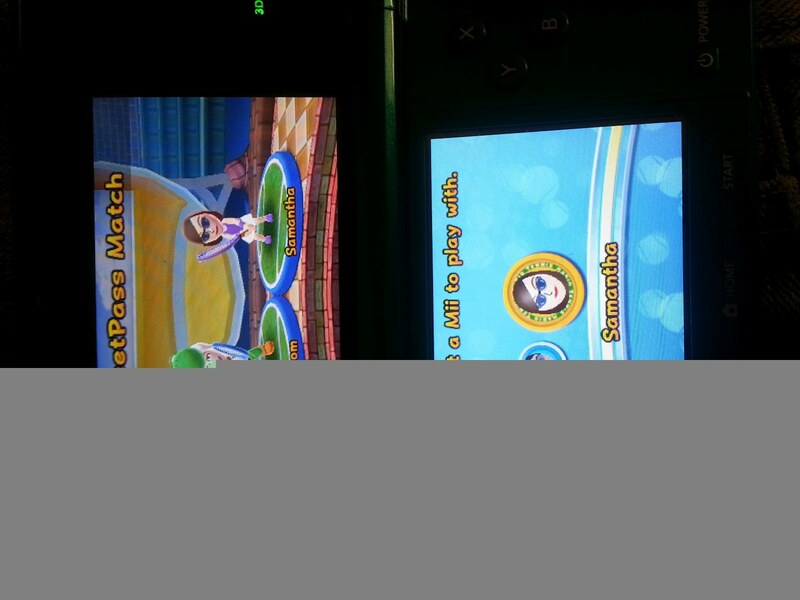 Mario Kart Wii and Mario Party 9 will resume and should both be done well before Giants. 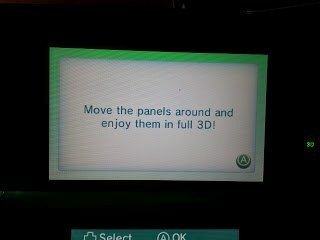 I will kind of go with the flow on Skyward Sword...let me know what you want to see and I'll try to make it happen. It was another busy week, but not without some cool announcements...Let's get started with the run down and go from there. I was out-of-town, but got to post the Round 2 Results and Round 3 Matchup Videos. As of right now there are 7 days left to vote in Round 3 (Elite Eight). Each contest has over 150 votes at this point, but the matches are not as close as they have been in the past...granted, that can change (especially with a week left). The vote margins run from 24-57 at the time of typing this post out. You can vote in the polls by scrolling down this page, finding the Twitter Feed, and then the polls will be right below. 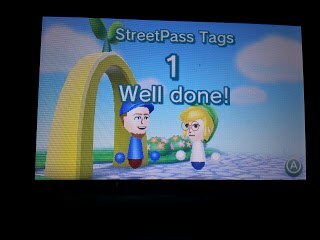 Well, with being out-of-town one should have the chance to get more and unique Street Pass Tags....If you follow the blog you know I hardly ever do. 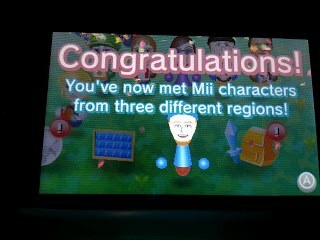 This past weekend I did get 2, but neither registered for Find Mii or Puzzle Swap?? 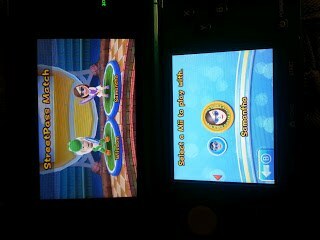 I'm not sure what the deal is there, but I at least got 2 new tags in Mario Tennis Open and got to bump the win streak up 2 matches! 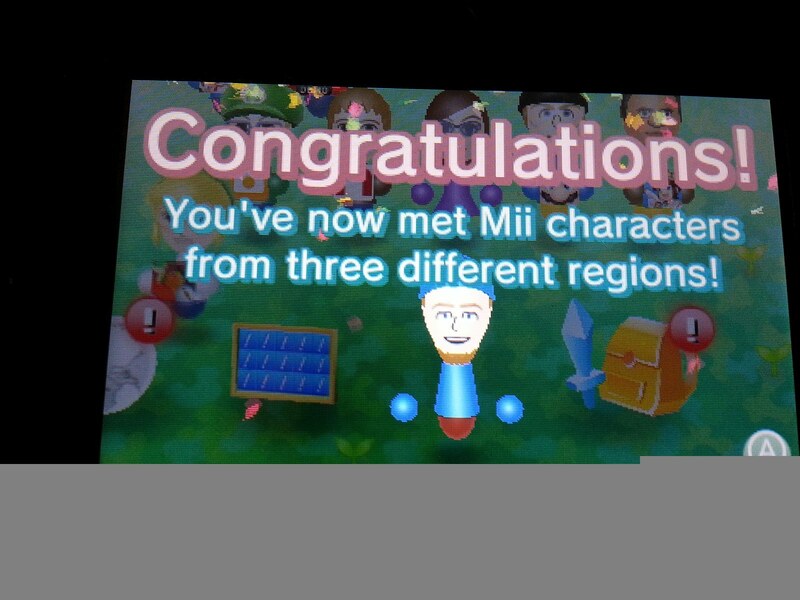 One opponent was fully equipped and the other was just in casual Mii trim. 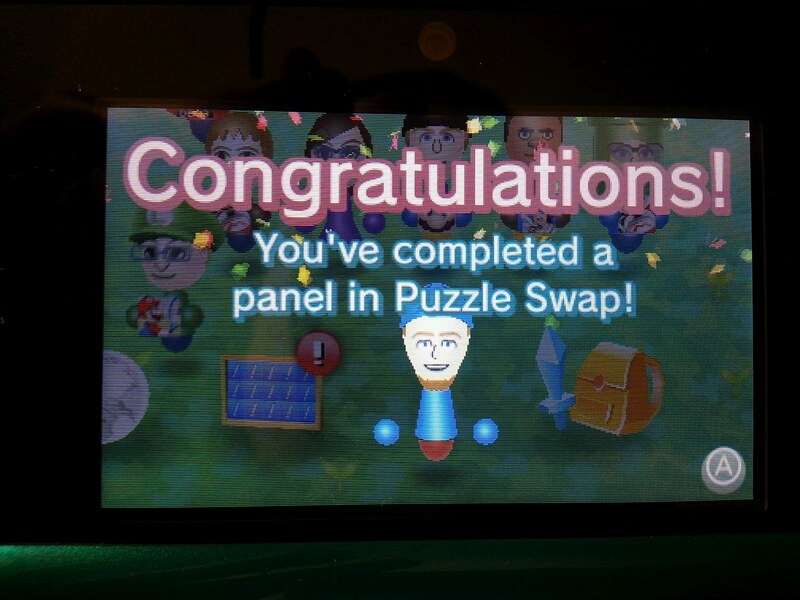 I'm not sure how I didn't get to use them for Find Mii/Puzzle Swap, but oh well. 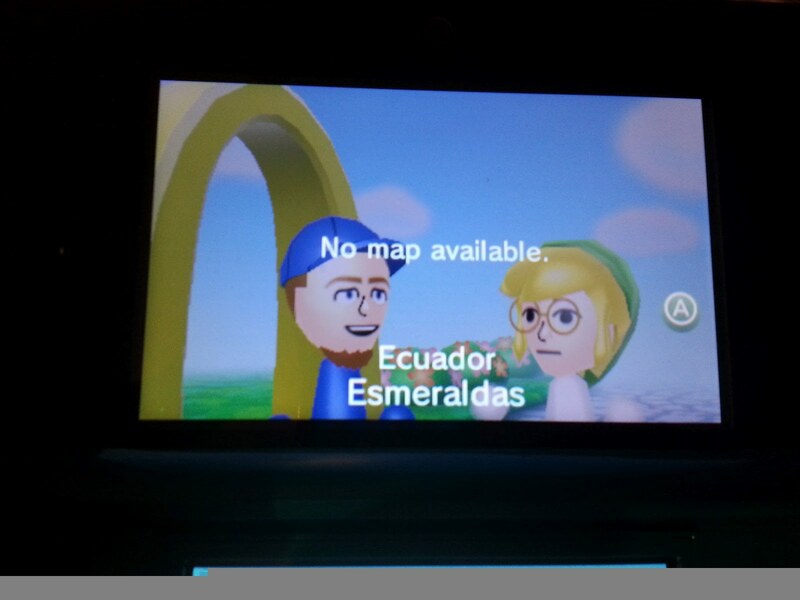 IF I'd have had genuine Street Pass tags, I'd have taken the time to rotate the photos...I snapped them at like 6 AM in the hotel room so work with me, lol. I have actually progressed quite nicely on this one...thanks in large part to using Play Coins. I am in the first level of the castle and was able to breeze through the Pink Slime right before that and got a sweet "Critical Hit" that finished off the otherwise tough Granite Golem with one swing. August 19th is coming up really quick and that is the day you can get your hands on the 3DS XL and New Super Mario Bros. 2. I'd really like an XL, but with my Aqua Blue 3DS in hand I can't really justify getting a new one at this point...Although that would allow me instant Street Pass Tags anytime I had both on...that might be worth it, lol. 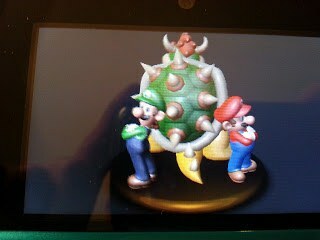 If you pick up New Super Mario Bros. 2 in stores and register it, you can get 50 Coins in Club Nintendo. 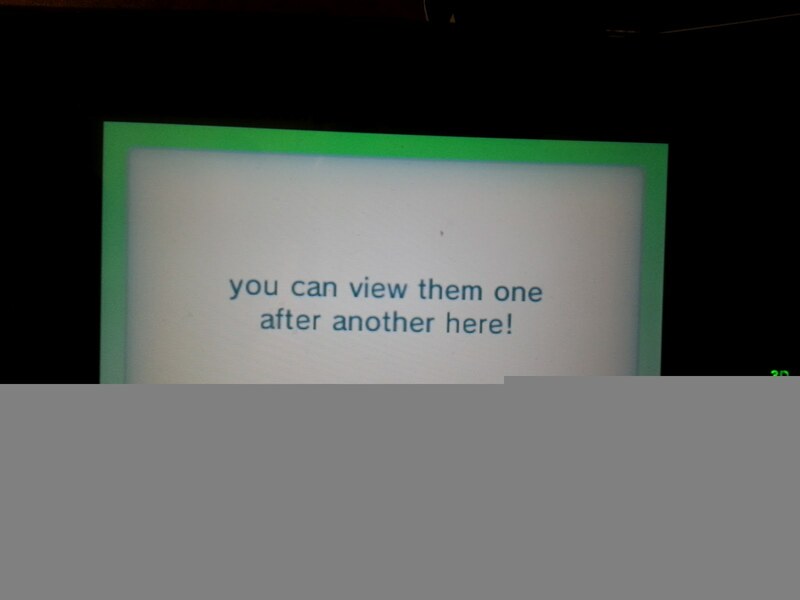 Since this is the first, in a likely long line of future releases, that you can "download" from the eShop, Nintendo has put a 100 Coin bounty on the title to encourage that action. I'm sure this is to test the waters and see how it stacks up with the mobile market, but I am one who simply likes to have the concrete product in my hand. My only reason to buy from the eShop in this case is to get the extra coinage...tempting, but not enough to sway from my preferred medium. 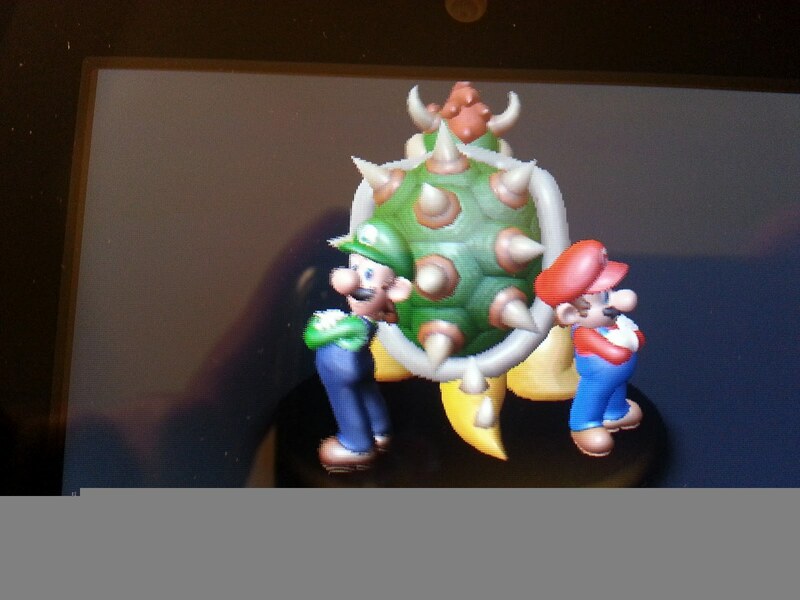 If you plan to get the game, be sure to say so in Club Nintendo for bonus coins. 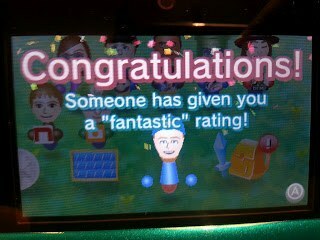 Speaking of Club Nintendo...Today (August 6th, 2012) is the last day to get your Gold or Platinum Gift. I'm Platinum and was torn between the cards and poster set. In all honesty I would like the calendar more, but it is not a full wall calendar...Plus Gold can get it. Majora's Mask was very, very tempting...but, in the end I went for the cards. I figure most will do the posters, making the cards that much more "unique." I like the posters, but I see the cards being easier to display. I put my order in tonight...As usual, December 20th or so was the estimated date. Keep in mind if you go with a game, it is available IMMEDIATELY. And in yet another segway, I also just sent out my first two Skylander Sidekick Offers. I went for Terrabite and Trigger Snappy. I'm not sure if I'll go for the remaning 2 or not...It isn't a horrible deal, but I'm also not big on the hassle of buying something I ordinarily don't (the bigger the bag of chips, the bigger the savings) and I'm mainly just not a fan of their insanely vague offering system. For all I know, both offers I sent in will return a Gill Runt. If things were nailed down I'd have probably sent in 4 forms. As is, I'm fine waiting and seeing what happens. I am still working to get all the main Skylanders (37), fully upgraded and through all 32 Heroics...I'm not in any hurry...I like to use it as a change of pace and to stay fresh with "Skylands" at this point. We really haven't had any big developments...aside from this one. 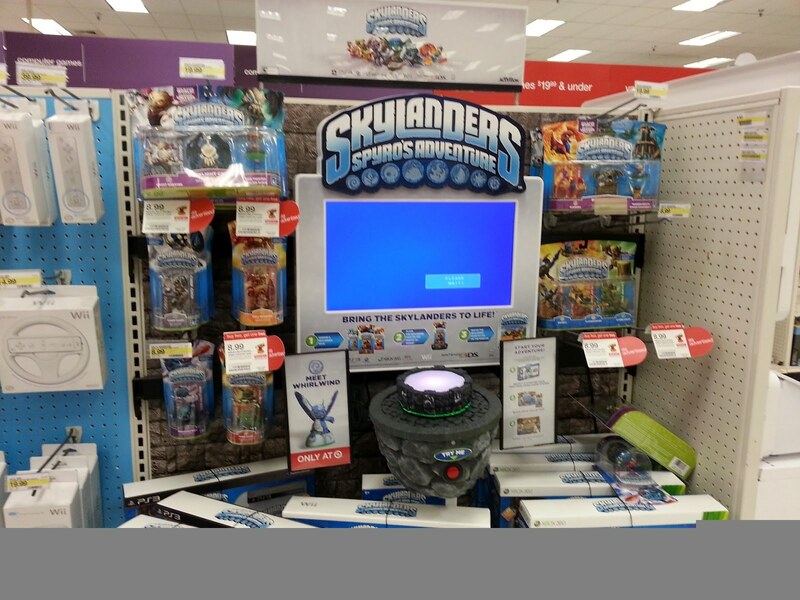 Earlier this week, GameStop announced that they had teamed up with Activision for an Exclusive "Battle Pack." This turned out to be the Golden Dragonfire Cannon Battle Pack. 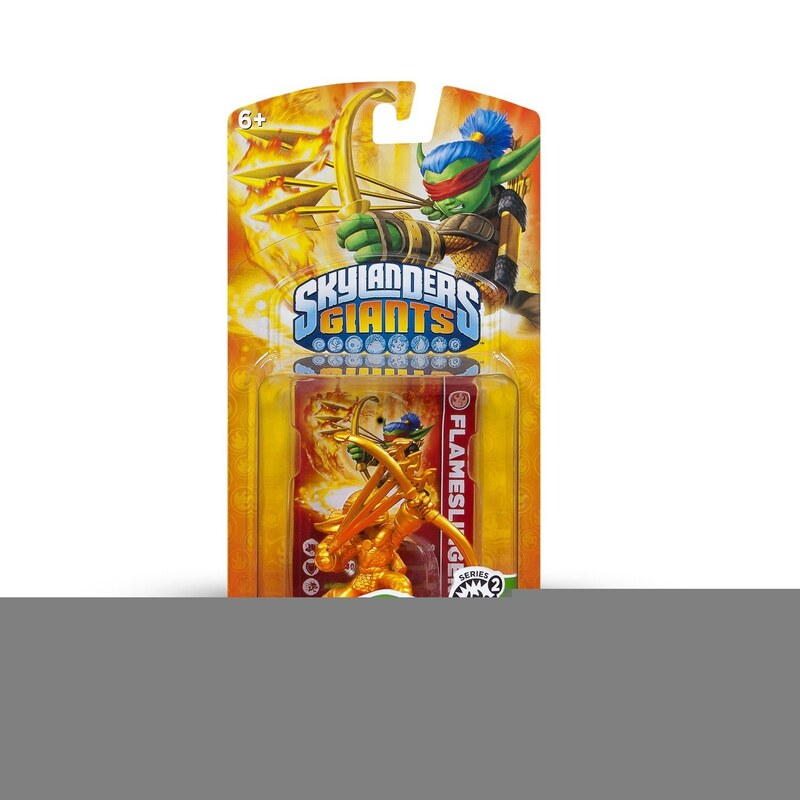 It consists of: Series 2 Reposed Chop Chop, the Golden Dragonfire Cannon, and Shroomboom. It is up for pre-order right now at the price of $24.99. As best I know, this will only unlock a new battle arena...it is not an adventure pack as some have reported. I would really like it to be, especially at that price, but it looks like it just unlocks an arena. Hopefully the Dragonfire Cannon will serve a unique role in the course of the game to make up for not being an actual level/chapter. 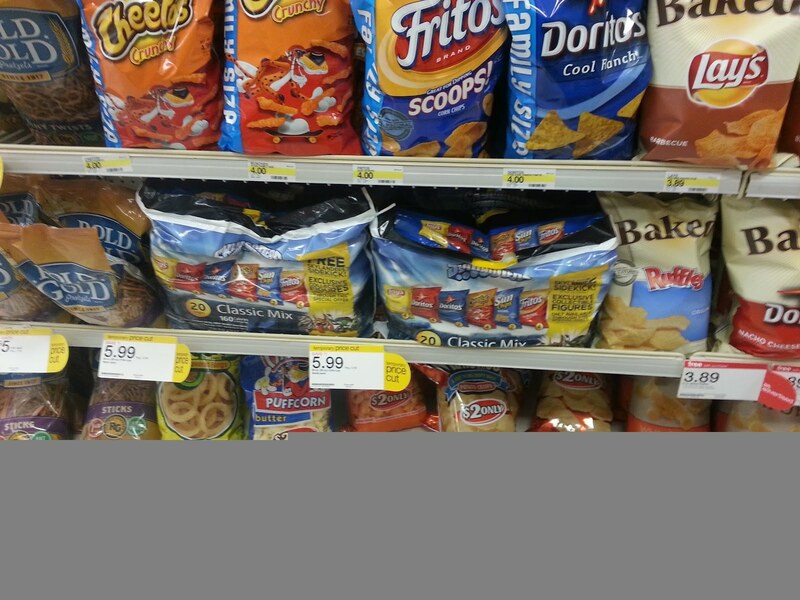 This first shot was at Target. 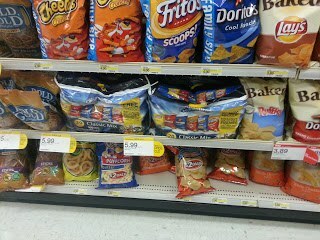 They don't have much, especially compared to all the "out-of-town" Targets I have been to recently. That said, I posted this for a reason. This is the very first time I have seen Dragon's Peak at this store! 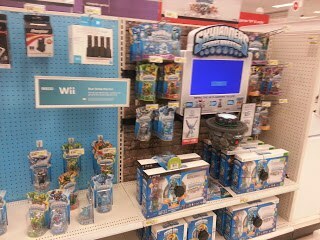 It is also the first time I have seen Lightning Rod, Zook, and Warnado (all in singles) at my local Target. The rest of the line up was: Dark Light Crypt, Empire of Ice, Chop Chop, Eruptor, Flameslinger, Wrecking Ball, and Boomer. 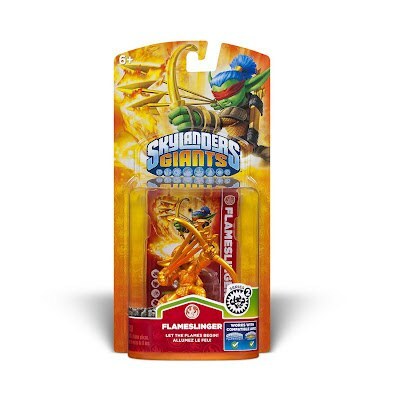 The lone Triple Pack was Drobot, Flameslinger, and Stump Smash. 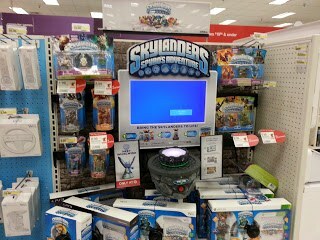 I also want to point out that I went back to the store 2 nights later...All that was left was Dark Light Crypt! 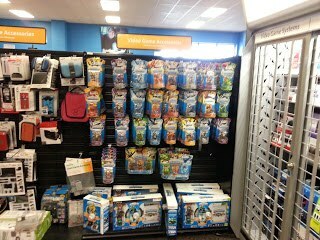 Next up is a local store that has a better stock...Pretty much everything but the Adventure Packs and Wham-Shell. 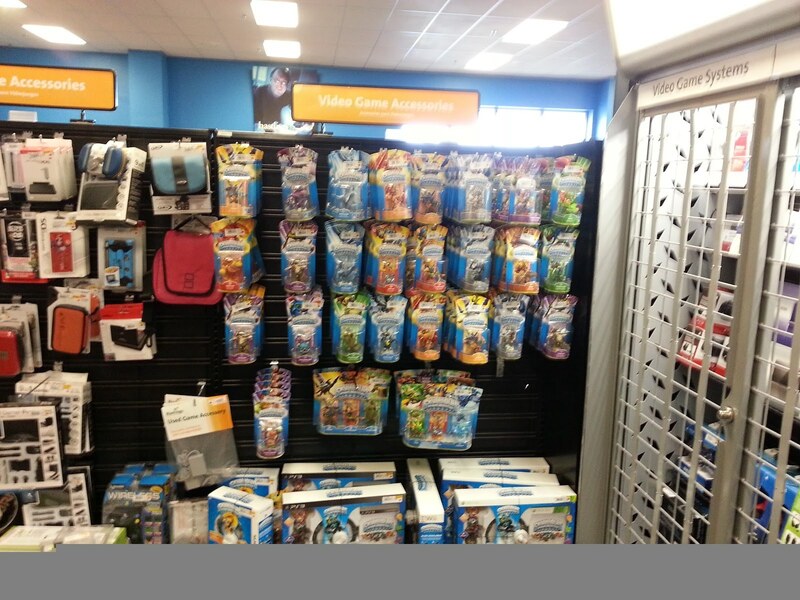 I had a few people ask me why I still look at Skylanders when I have the complete set. First, it is kind of a habit at this point. Second, I like to keep tabs for myself and others as many still don't have the complete set. Lastly, you never know when a new variant will spring up, or when you might land an already known variant...Just this past week I've seen 2 people get Crystal Stealth Elf...Most people gave up on that and Glow-in-the-Darks weeks ago...It is unlikely, but not impossible...I like the odds! 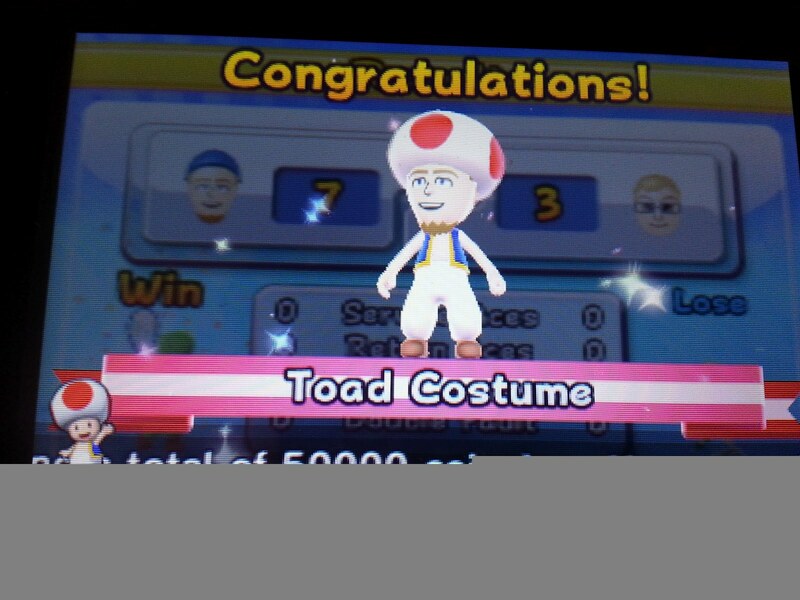 I just edited a few more Mario Kart Wii videos...I should upload one or two later tonight as a matter of fact. That said, I am obviously working on editing up through Part 16 which were all recorded over 2 months ago! Once Part 8 of MKW is uploaded I will spring Mystery Game 1 in the mix...I'm just doing a quick playthrough on it..nothing major, but I think it is a fun game that doesn't get much love. 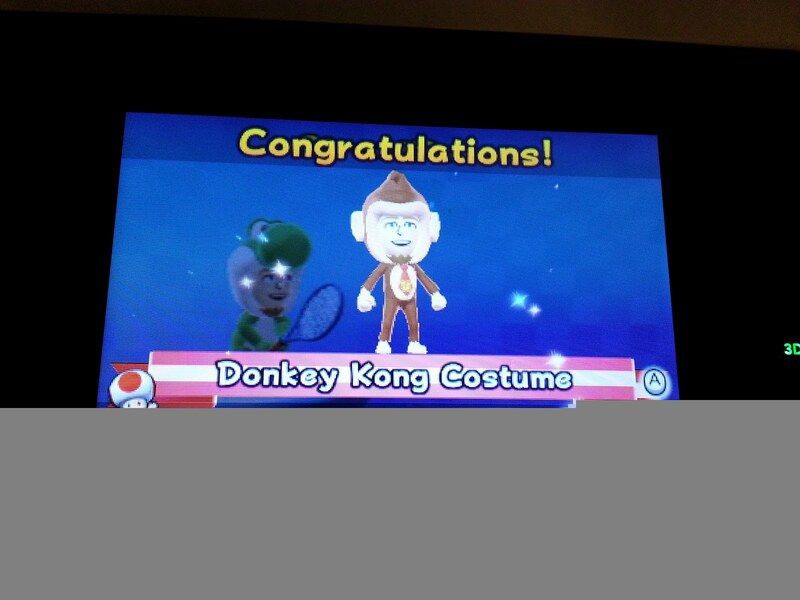 The goal here is to finish recording Mario Kart Wii and "Mystery Game 1." Around the time that happens I'll kind of go into what "Mystery Game 2" is, what happened, and what people want to see...I've actually recorded the update video covering that...just need to upload it. 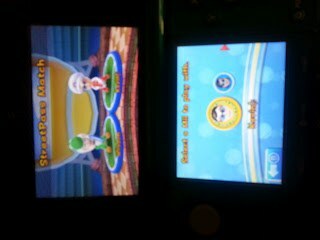 As for the 3DS end of things...I am working towards unlocking all the items in Mario Tennis Open...I just lack 25 at this point, although it is seemingly taking forever. 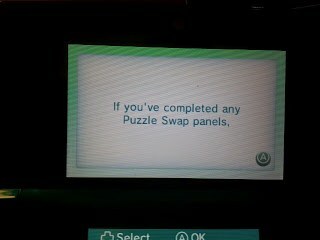 I really want to get Professor Layton and the Curious Village wrapped up ASAP. 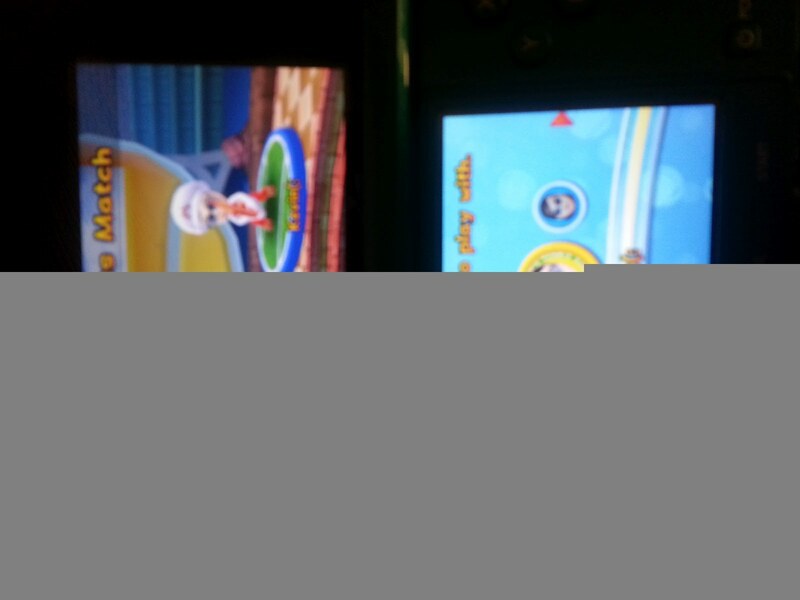 I'd like to have an open slot for New Super Mario Bros. 2 and some other things. Well, that does it for this week. I should have some new videos going up this week and I am really hoping to get back to recording...The main thing is to have Mario Kart Wii and "Mystery Game 1" wrapped up and uploaded by the time Giants comes out. Obviously, the sooner they get done, the sooner I can move on to something else before Giants...However much of a time window I've got will kind of dictate what I decide to record before hand. I will hope for a regular (Thursday/Friday) update for this week and might have some more news to spring then, or very shortly there after. 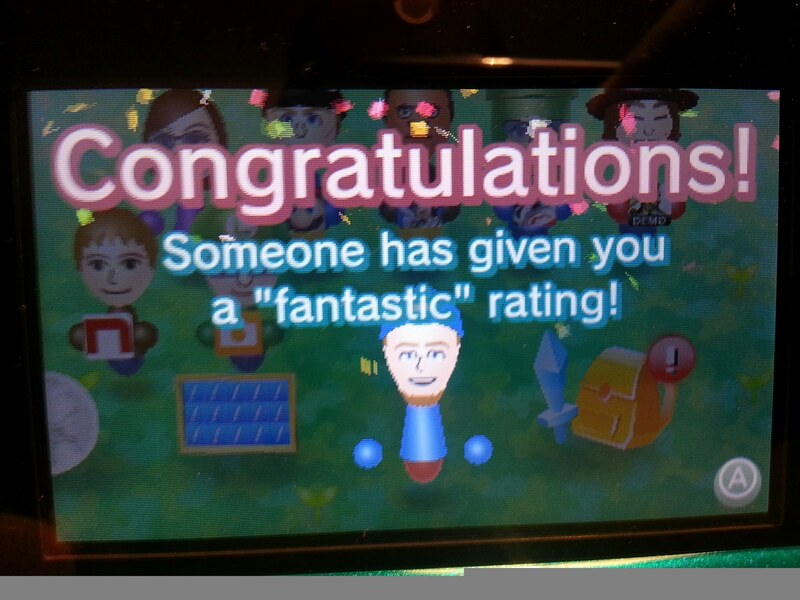 Well, hope you enjoyed the post and stay tuned for some big udpates. Also make sure to vote in the Skylanders Battle Tournament! It is just 2 months and 15 days until Giants! !